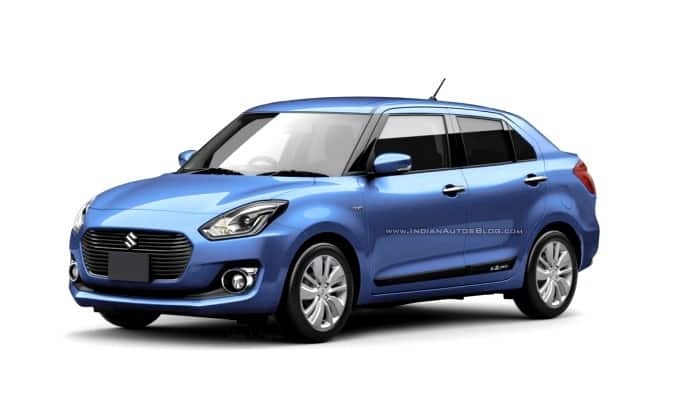 With only a few months left for the launch of the brand new version of 2017 Suzuki Swift Dzire, automobile enthusiasts are already flooding websites featuring the new car design and specifications. Since the introduction of Swift Dzire in the sedan segment of Indian automobile market in 2008, it has been a runaway hit. However, with the passage of time and entry of new models in the sedan automobile segment having contemporary designs and state of art technologies, Maruti Suzuki Swift Dzire did have a lot of competition to juggle with. This is the reason behind the constant feature up gradation of the Swift Dzire. Let us now focus on the five core areas in which the third generation Swift Dzire promises to be different from its earlier predecessors in terms of styling revision and equipment which it has to offer. Externally the car model will not be much different from its predecessors. Common elements which will be retained are the headlamps, bonnet and front fenders etc. However certain eye-catching tweaks and curves have been inserted into the car body keeping in mind the market requirements simultaneously with curving the product niche. In the new model, the boot space is expected to be increased and the grille will get a chrome appliqué makeover. Tail lamps featuring LED strips, redesigned rear bumper, shark fin antenna, LED Daytime Running Lights, swept back projector headlights and integrated boot spoiler complete the new facelift. Side profile of the new Swift Dzire will resemble the equally popular car model Baleno. The car interior is expected to follow the design pattern of 2017 Suzuki Swift hatchback. From the images of the new model going viral on the internet, we expect that new model will retain its signature dual tone interior of the cabin however its layout might change. The leather-wrapped steering wheel with mounted controls will now give its riders a more premium feel. The car dashboard is likely to be equipped with a gigantic 7-inch touchscreen infotainment system and digital climate control display. There seems to be no change in the engine platform with Dzire staying in safe waters with its good old 1.3-litre DDis diesel and 1.2-litre petrol mills. Both the variants will be accompanied by a standard five-speed manual gearbox. However going by the spy images, the Dzire might also be stocked up with an automatic gearbox variant. Maruti Suzuki has always maintained the strategy of competitive pricing to capture mass market. However, with the implementation of new features, the car is expected to have a price bump. However, the hike is expected to retain within the pricing brackets of 10000-15000 INR. There are high chances of the launch of a 1.4-litre turbo petrol variant. The pricing of the same will be around 10 lakh. Dzire already gives a brilliant mileage of 20.85 kmpl (petrol) and 26.59 kmpl (diesel). However, fingers crossed if the car manufacturers decide on adding an SHVS unit then the fuel consumption will be reduced by 3-4 kmpl. At present Ciaz loaded with the SHVS engine is providing a mileage of 28.09 kmpl and has been branded as the most fuel efficient car in Indian automobile market. One of the key focus points of Maruti Suzuki has always been its safety frontiers. Equipped with dual airbags, engine immobilizer and additional reverse parking facility, the new car model is expected to set a bar in its own segment for others to match up to. The second generation of Swift Dzire found itself many takers in the market. Hence it is expected that the 2017 Suzuki Swift Dzire will sell off like a hotcake with its flashy new features.